The annual match between the Dutch National Champion and the Dutch Cup Winner has a new logo. For several years this match was named after Johan but from 2017 on it will be more visible, with a stronger link to what Johan has meant to Dutch football. Besides that, the Johan Cruyff Shield has a focus on the social part of football as well. 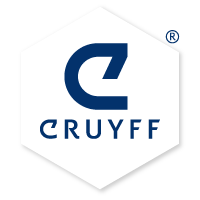 Therefore also a strong presence of the Cruyff Foundation.